This topic contains 1 reply, has 1 voice, and was last updated by Jesusalva 4 months ago. Even so, I’ll just share with you everything I have writen this far. There’s no warranty I’ll finish this, so I did not wrote my name on Walkthrough Sign Up Page. THIS ENTIRE TOPIC IS SPOILER. Well, not really, as I’m omitting every story detail (even Boss Names and such). Even so, player discretion advised. @msg-commander started writing the page at level 30. I’m still at level 26, so I might be able to aid a tiny bit on this. 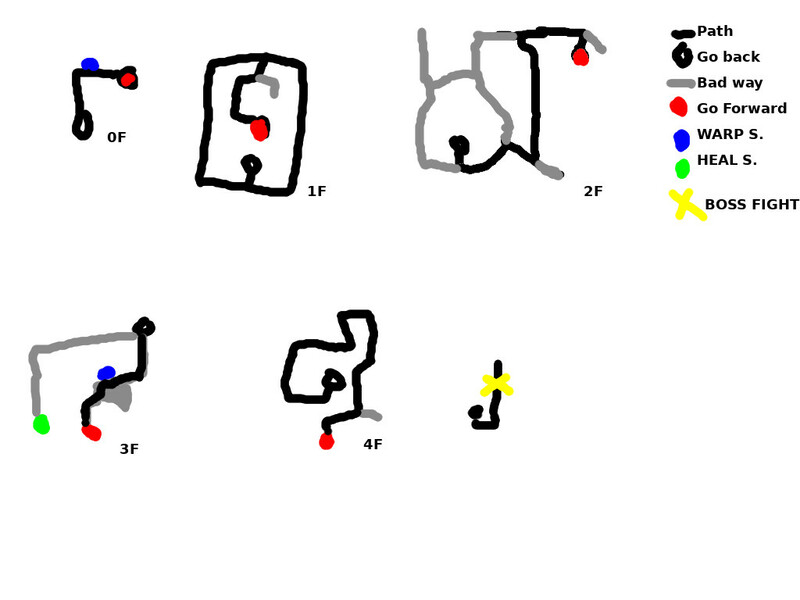 More to a “Dungeon Guide” than a Location Guide, but oh well. If I say to follow the path, this means there is no fork on the road, or if there is, you should ignore it and keep your previous movement. I play on easy, and sometimes the bosses doesn’t even get a turn. You may need to formulate better strategies or find out the bosses true power on harder difficulties. I’m not noting down their weakness either. This may never be finished, so if you fell like picking it up and finishing, by all means do. As a side note, when you get to a Town, I’m only marking you arrived at it, and ignoring any thing you might need to do there. I’m also skipping treasure chests. Likewise for secret passages. Common monsters (drops, steals, weakness etc) as well. There’s no minimap, by the way. Follow the path. The forks are irrelevant (it’s like walking in circle because a big obstacle on the middle). -> You arrived at Candal Village. -> Take the time to complete Subquest 1. 0F (east) – Follow the path. 1F (east) – Follow the path. There’s a dead end on the end, but by then, you can already see the stairs (they’re at southeast edge). 2F – Go west (and then south) to trigger the WARP SIGIL. Keep following the path and a cutscene will happen. Then go left (in case you forgot because the cutscene). 1F (west) – Follow the path. There’s a REGEN SIGIL at southwest edge. Go north to face the boss. BOSS TIPS: The boss may cast “Black Hole” and inflict several ailments (poison, fatigue, laziness) on the party. Poison don’t go off when the fight end, so using the regen sigil after the fight is advised. Keep going north to leave. 0F (west) – Trigger the WARP SIGIL. You’re out, basically. Follow the path until you see the bright yellow barrier. BOSS TIPS: There are two enemies. Just transform everyone, and maybe they use a “Pierce” skill which frankly was not remarkable. Party Level after the fight: 9. Follow the path and leave for Aural. -> You arrived at Aural Village. 0F – Trigger the WARP SIGIL north of where you are. Then, head east. 1F – There’s actually a big rock on the middle of the map with two exits. Therefore, take any branch (it doesn’t matter which one), and when you can, head south. Take the west path. 2F – Head east, and take the second branch north. Follow the path. Take the east turn. The stairs will be south of you. 3F – Walk east and follow the path for the REGEN SIGIL. Return to the stairs. Head south and Follow the path until you see the WARP SIGIL and trigger it. Then go south. 4F – Follow the path. 5F – Follow the path. BOSS TIPS: Heavy tank with lots of HP. May use “Grand Break”, which causes decent damage (~40) and may inflict status effects (Idle, Fatigue) on your whole party. Just transform to Knight use lots of skills, as usual. Party Level after the fight: 14. XF – Follow the path. The main story task will complete itself with various cutscenes. -> You arrived at Judgement Village. Head north, past the weapon shop, to leave the village. 1F – Follow the path. Remember to trigger the WARP SIGIL. 2F – Go south until the bottom, and then east until the the stairs (on southeast edge). 3F – Go south, following the path. 4F – Go to east until the end, and then go south until the stairs (on southeast edge). 5F – Go west, and then south. Follow the path. 6F – Go east for the REGEN SIGIL. Then go west, take the south branch, and follow the path. 7F – Take the east path, and enable the WARP SIGIL. Then go north. BOSS TIPS: Uses “Judgement” Skill, which lowers all your party parameters (ATK/DEF/INT/SPD). Remember Caine as Guardian can raise party ATK/INT. Remember Lilith as a Healer can heal everyone and lower limiter. The boss may also use “Baby Swing”, which causes damage to whole party (and also causes a status ailment, probably Fatigue). -> If you have spare money (I had 99k by then), visit the Est Realm (Easy), and manage your weapons. -> You arrived at Batan Village. 1F – Go east to trigger WARP SIGIL, then north to climb the mountain. 2F – Take the west branch, then follow the path. Keep on the path until you find stairs at southeast edge. 3F – Go north, follow the path. The stairs are at northwest edge. 4F – Take the east branch. Trigger the WARP SIGIL. Go either north or east for the REGEN SIGIL, otherwise, south to continue. Follow the path. 5F – Go west, follow the path. The stairs are at northwest edge. 6F – When given opportunity, go south. Keep following the path. The first south entrance is a REGEN SIGIL. The second and last south entrance are the stairs. 7F – Follow the path to north. The stairs are on the northwest region, but not on the edge. 8F – Trigger the WARP SIGIL, and go forward. BOSS TIPS: Can become immune to physical attacks, giving Caine the support role. Use Ice Pick (Lilit), Aura Power (Caine/Guardian), Beam/Flame Cannon (Fleon/Knight), Thunderbolt/Shine Bolt/Lewin Attack (Julie/Knight), and it should fall before it can attack you again. Party Level after the fight: 24. -> Take your time to complete Sub Quest 05. There are 72 users online - 0 registered, 72 guests. Nice game, could have been better….